The guest book area was a space we had a lot of fun with. During our planning session it was clear this was an area that needed some definite style, but all the couple had was the book. They knew that they wanted to display pictures of grandparents and other family members somewhere. I suggested we create one table that could be a guest book table but also a table that spoke about the couple. I asked Katy and Jon Erik if there was anything they loved to do or collect. They both looked at me blankly saying they had nothing until Jon Erik pipped in that they loved to fish and that he collected vintage lours and reels. 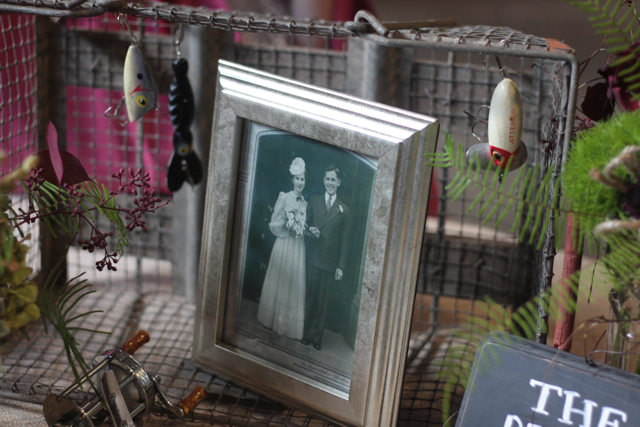 This was all of the inspiration I needed to create this wonderful guestbook table. Family photos were gathered and framed. Jon Erik provided me with his vintage fishing tackle. I also asked the couple for old love letters or any other personal information they would like to share. 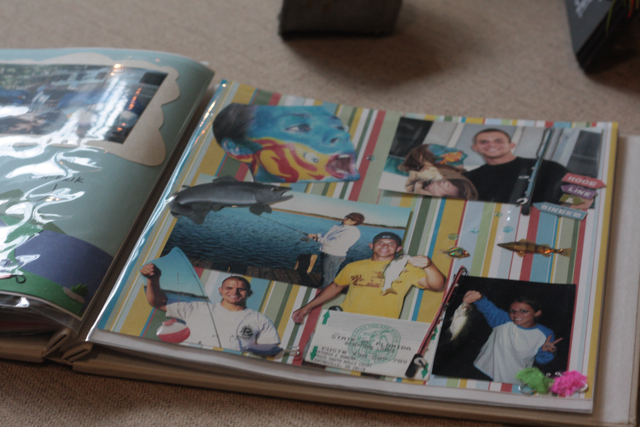 They rewarded me with a fabulous album of their journey as a couple and one of the pages was all about their time fishing. This came together like magic. 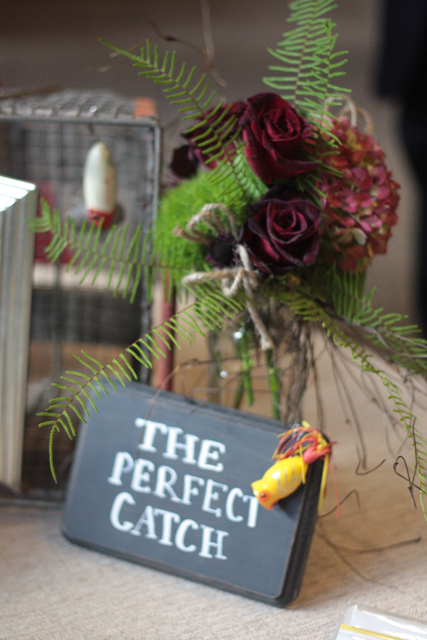 We could not resist phrases like "the perfect catch" or " tell us a tail." 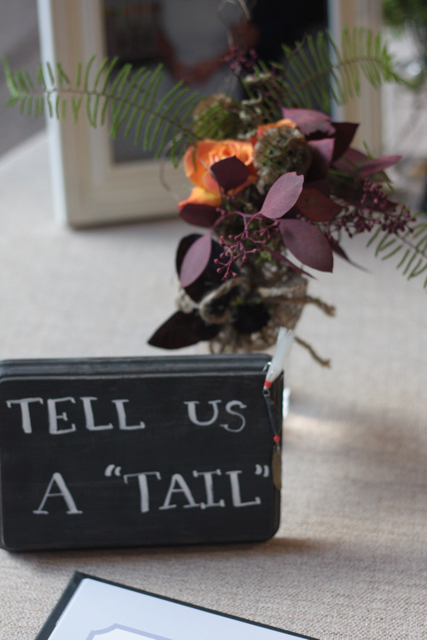 The "tell us a tail sign" was placed right next to the guest book. I can thank Kelly Lanza for that last minute creative outburst. We made that sign right on the spot. 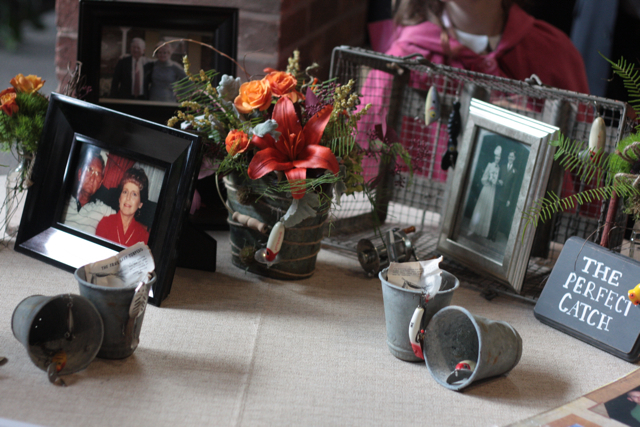 Of course we brought lots of mini flower arrangements and props for this table too. I was told by the day-of planner, Kelley Cannon, that people were at this table all night, browsing and signing the guestbook. That was my goal of course. SUCCESS! This fun vintage wooden basket was used for cards. 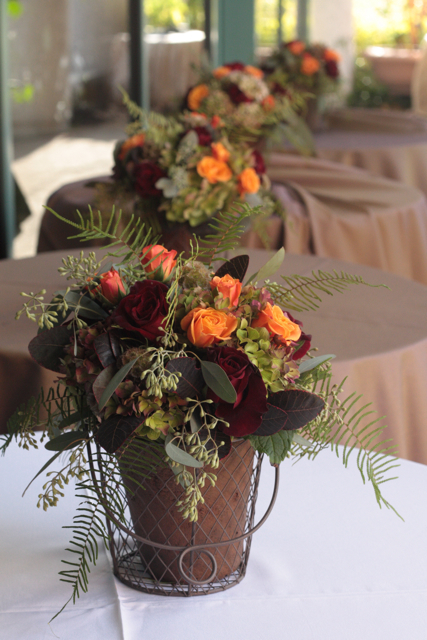 The gift table also had an awesome floral design as the backdrop. These fun designs were created for the cocktail hour. In the background you can see the accent linen I chose for the cocktail tables. We also designed the cake topper. Katy wanted the top of the cake to be very simple. When I suggested a monogram she was sold. I have made these several times before we have always used the herb rosemary. 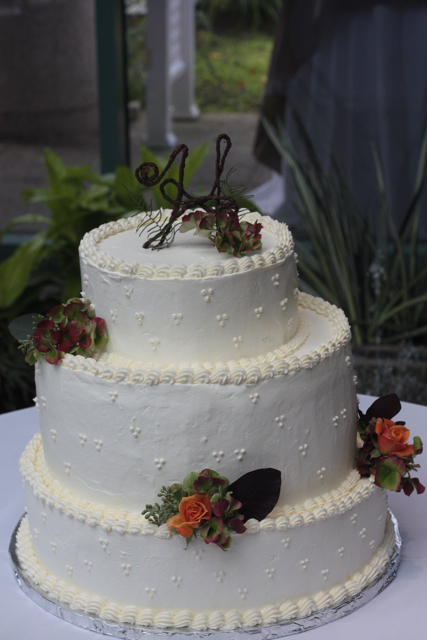 For this cake I chose to have the monogram created with the bark wire. Elodie actually fashioned the wire into the H form. I absolutely loved this wedding and I am so totally thrilled and proud of the results. I look forward to seeing the real images from photographer Genevieve Leiper, however I think we will hold onto these for a little while, just to keep you in suspense. Katy and Jon Erik, we LOVED doing your wedding, happy married life!!!!!!!! I love these. Some great ideas.